EU officials hope the emergency summit on Wednesday (23 September) will deliver concrete pledges of support for Turkey and other nations housing some 4 million Syrian refugees, as well as for the 11 million Syrians now homeless inside their own country. The European Commission said last week it was ready to come up with an estimated €1 billion for Turkey, more than five times what the EU has already mobilised for the 2 million refugees there. Asked to comment if the money was available and where it would come from, Commission spokesperson Natasha Berthaud said the issue would be discussed tomorrow morning at the executive’s college meeting, which precedes the summit. It remains unclear what strings would be attached to the disbursement of such a huge sum. A senior official told Reuters that about two-thirds of that sum would come from existing funds penciled in for Turkey, officially an EU candidate country, and the rest by diverting other money in the EU’s common budget. But a key element would be raising a matching sum from EU states. It remains unclear if the amount would be determined by the executive in the same way that it proposed quotas to re-distribute migrants, or would be gathered on a voluntary basis. Funds would be used to help the most affected communities, boost health services and support teaching in Arabic. In return, Turkey must do more to improve the conditions for refugees, to fight smugglers and stop more people reaching Greece. Turkey wants money, but also more recognition of its accession status, having been held in limbo for years. Europe is considering holding a “mini-summit” with Turkish President Recep Tayyip Erdo?an on 5 October. 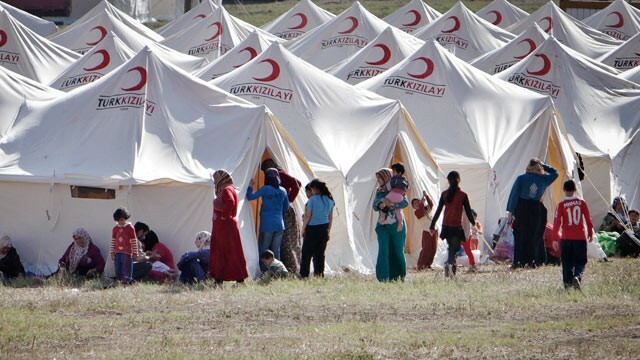 Turkey, which hosts the world’s largest refugee population, has so far spent $7.6 billion caring for 2.2 million Syrians who have fled strife there, a Turkish deputy prime minister said on 18 September. The figure is impossible to be verified. Turkey has been on the front lines of the biggest refugee crisis since World War Two. It shares a 911 kilometre-long border with Syria, and used to have an “open-door policy” towards those fleeing the civil war, now in its fifth year. But now this policy reportedly no longer applies, as Turkey is more concerned by the rise of a Syrian-Kurdish statelet in northern Syria. Kurdish forces in Syria have the support of US airstrikes, while Turkey is suspected to secretly support ISIS, the enemy of its worst enemy. Reportedly, Syrian Kurdish leaders plan to capture the last border crossing point between Syria and Turkey held by ISIS. This would making it impossible for jihadist volunteers from Europe and elsewhere to reach ISIS-held territories. On Monday (21 September), EU spokesperson Margaritis Schinas avoided answering a question by EURACTIV if the refugees coming to Europe these days were fleeing Syria or in fact, Turkey, where they have been stranded for years. Turkey, officially an EU candidate country ??!! We have enough E.U. states with problems to solve !!!!! Turkey receives money from the E.U.citizens ? whilst still remains the status of “candidate” ??!! What kind of tactical plan is that ? However Turkey can receive the 11bn Euro fines from the VW chief …. and where is this billion coming from and who’s money is it they are giving away… its no wonder the EU wants its own tax raising powers… well I do not support the EU… and no I don’t want to pay taxes to the EU.